# Fly dual, as co-pilot, with your Instructor to guide you. # You may take controls after take-off, if your instructor thinks it is safe. # Bring a camera! Record your first flight! # We normally land back close to where we started from. # 100kg max, Tandem is less arduous than solo training, No age limit. # BHPA membership included in booking fee. 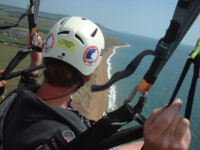 # Soar along the beautiful Isle of Wight coastal cliffs(weather dependent). # Soaring flight usually lasts 15-20 minutes ( weather permitting). # Free upgrade! Your fee can be treated as deposit on an EP Course. # Paragliding is absolutely weather dependent for safety. Please call us in the days before you are due to be setting off, to assess the forecast conditions. 100kg max, Tandem is less arduous than solo training, No age limit. Isle Of Wight PO38 2HL .